Sleep inside a tent (under a roof). Like the idea of a tent but also a hotel room, too? 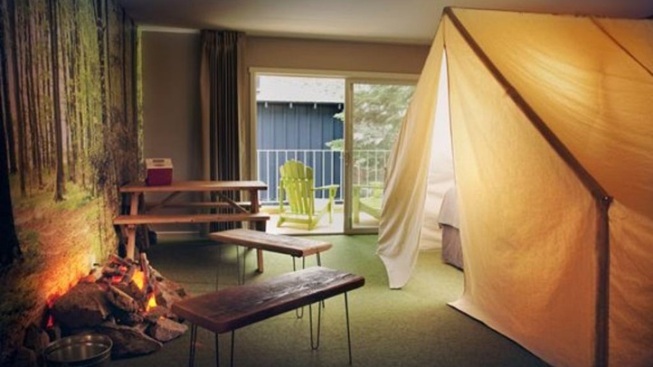 The Great Indoors, a room at the Basecamp Hotel in South Lake Tahoe, could be your perfect hybrid getaway. TREES, TENT, BUT NO RAIN: Acting as though the world is divided into two types of people -- people who want to rough it under a canopy of rain-drippy treetops and people who will only order from room service if the meal is served alongside a linen napkin -- is to do a disservice to all travelers. We all possess some facets to our personality that respond to both kinds of getaways, be they indoor or outdoor. Do we adore the idea of adventure, of a tent, of trees, and sky? Many do. Would it be nice to have a bathroom right there, and maybe a comforter that isn't too damp, and soft carpeting rather than hard ground? That's pretty to find, too, when on vacation. But it can be a challenge to find a winning, and charming, combination of the two. LOOK TO RUSTIC-QUIRKY DESTINATIONS... like South Lake Tahoe's Basecamp Hotel, an inside-meets-outside medley of lanterns and bear prints and, yes, a tent inside a room. Everything at Basecamp, which five minutes, on foot, to the lake and even less than that to the Heavenly Gondola, is under roof, but not under the rules of traditional hotel decor. Call it a campout, but without the piece of lumpy bark under your back all night long. The hotel's founder Christian Strobel wanted to bring the "spirit of exploration" to his property, which mirrors "the ideals of a base camp." It has been delivering that communal-nice feeling, but with the privacy of individual hotel rooms, since the summer of 2012. LOOK, WE'RE NOT BAGGING ON THE BARK -- that's part of camping fun, feeling the earth under you as you snooze -- but staying in The Great Indoors, one of the hotel's theme-sweet suites, will give you that tent-specific taste, but with a bed. The tent is indeed over the bed, and across from it? A wall of trees, plus benches, plus a faux campfire. Stars that glow lend some night-sky cuteness to the accommodations, and camping chairs are for your chillaxing pleasure. There's wifi and a walk-in shower, to remind you you're actually in a hotel room and not near some remote stream. If you don't require a bed-inside-tent sitch, ponder booking an Explorers Club room, or the Mountain View Suite. Every room has a touch of the wilder world, but brought inside, stylishly. Thank goodness there's a middle place for lovers of outdoorsy adventure who have to have nice bedding and a walk-in shower, too.